Determined to make a new start in her quaint hometown on the banks of the Mississippi, Brandy Borne never dreams she'll become the prime suspect in a murder case. . .
Moving back in with her eccentric, larger-than-life mother, Brandy Borne finds small-town Serenity anything but serene. 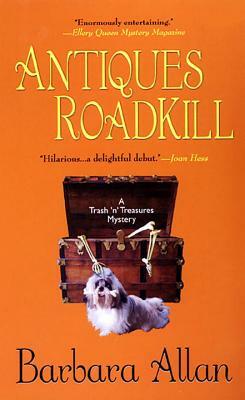 It seems an unscrupulous antiques dealer has swindled Vivian out of the family's heirlooms. But when he is found run over in a country lane, Brandy becomes Murder Suspect Number One--with her mother coming in a very close second. . . The list of other suspects is impressive--the victim's business seems to have been based on bilking seniors out of their possessions. And when the Borne "girls" uncover a few very unsavory Serenity secrets, they become targets for a murderer whose favorite hobby seems to be collecting victims. Barbara Allan is the joint pseudonym of acclaimed short story writer Barbara Collins (Too Many Tomcats) and New York Times bestselling mystery novelist Max Allan Collins (ROAD TO PERDITION). Their previous collaborations have included one son, a short story collection, and five novels, including the 2008 winner of the Romantic Times Toby Bromberg Award for Most Humorous Mystery, ANTIQUES FLEE MARKET. They live in Iowa in a house filled with trash and treasures.